Blagg & Johnson Ltd was founded in 1921 by a native of Newark, Miss Emily Blagg, with an American, Mr Frank Millhill Johnson, to produce bricks. The Palace Theatre in Newark was constructed from Blagg & Johnson bricks. The firm transferred from bricks to pressed metal angle beads for reinforcing the external corners of brick walls. Today it is a leading supplier of pressed metal sections and fabrications to the agricultural, building and vehicle industries. It also offers sheet metal work services, welded assemblies and Jupiter metal angle bead, all of which are undertaken to customers’ own specification. 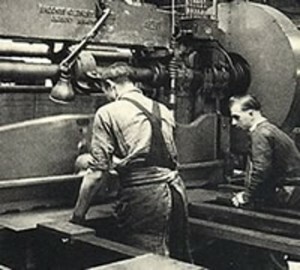 For over 90 years the company has grown steadily along with the range of services and techniques that are available to its customers. The firm has a reputation for being flexible, capable and reliable. Caring about each customer and personal attention have kept them ahead in a demanding and competitive industry.